Epiphone is a Gibson brand, and with Gibson in the background, you know you can expect great things to come to pass. The DR-100 model has been a timeless acoustic guitar for Epiphone. It’s the highest-selling model to land in the hands of beginners and professionals who want to have fun when they jam. But, for a guitar under 200 dollars, can much really be expected? For the low price, laminate is expected, and that’s what you get. You have mahogany for the back and sides, a spruce top, and a glued Okoume neck. Okoume is a relatively new tonewood used in guitars for its light and bright acoustics like maple. However, it’s been used for the neck on the DR-100 for its unusual light weight. S peaking of the neck, the acoustic guitar has Gibson’s SlimTaper design. The steep curve under the neck shape allows for fast-moving access to the entire fretboard without having to compromise on grip. It’ll also be easier for beginners and those with smaller hands to maximize tonal range across the neck. The acoustic guitar has the time-honored dreadnought body style that’s versatile enough to provide a variety of music genres. With dot inlays, premium tuners with nickel hardware, and a black vintage-style pickguard, it’s no wonder the Epiphone pleases all – it’s simple, well-made, and affordable! As the best-selling Epiphone acoustic guitar, it’s obviously doing something right in the sound department. It packs a loud punch with its strengths in the mid to high tone ranges that ring out in note-cutting clarity. It seems the Epiphone guitar is an open book – you get what you expect. When you’re shopping on a budget, there’s no room for dire surprises. Take the guess-work out when you’re wondering about quality and stick with an Epiphone – you’ll be pleasantly surprised instead! Buyers love the beautiful gloss finish with the gorgeous white binding that makes the guitar look like a star in and of itself. It sounds as expected for a machine-laminated guitar, but it’s more than acceptable for learning, beginner, practice, and “play everywhere” guitar. However, quality control issues with the neck have come up. They’re either warped upon box opening, or the fretboard is very rough for the player causing fret buzzing and sore fingertips. There obviously has been no manual labor to sand and smooth down the frets as this would drive up the cost of the Epiphone guitar. But, with a professional setup to adjust the truss rod, file down the fretboard, and maybe upgrading the machine heads, this will be a guitar that will impress for a long time to come! Another similar alternative is the Ibanez IJV50 acoustic guitar. It sports the same ambidextrous dreadnought body style, gloss finish, laminate mahogany body, and spruce top. It’s in and around the same budget class as the Epiphone, but the Ibanez includes a gig bag and some extra accessories in the purchase. It sounds like a good deal to us, what do you think? But, if you’re looking for something a little smaller for travel or for a beginner child or smaller adult, the Yamaha JR1 FG Junior 3/4 size acoustic guitar could fit the bill. It includes an entire package of accessories to get started and a Guitar Lessons DVD. Meranti back and sides, spruce top, and a nato neck make for an affordable buy with its laminate construction. What is the Epiphone DR-100 size? Is this a 3/4 or Scaled Down Size Guitar? No. This is a full-size guitar with a 25.5″ scale, 41″ long, and 4.6 lb acoustic guitar. Can this Guitar be Plugged into an Amp? This is an acoustic guitar only without any pickups for electric use. Does this Acoustic Guitar have a Solid Top? To keep prices economical or first-time and beginner buyers, the DR-100 model features a laminated top. It’s common for beginners to upgrade to a solid top acoustic guitar after attaining some guitar skills and having outgrown their starter guitar. How is the Epiphone an Ambidextrous Guitar? Sporting the dreadnought body style without a designer cutaway, the strings can be put on in reverse for a left-handed player. However, the pickguard would be upside down as it’s primarily a right-hand model. Does the DR-100 Acoustic Guitar come with any Accessories? Unfortunately, the guitar with pre-strung strings are the only items to be expected in this purchase. You will have to purchase a case and any accessories separately. 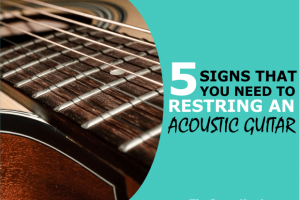 Is there a built-in Truss Rod in the Acoustic Guitar? There is a dual-action steel truss rod in the guitar. Adjusting will help to find the action you prefer. Where is the Epiphone Made? The Epiphone DR-100 acoustic guitar is made in China. What are the Finish Options for this Acoustic Guitar? This is the Vintage Sunburst model. However, the DR-100 is also made in Ebony and Natural. Does the Sunburst Design wrap around the Back of the Guitar? The Sunburst finish is seen only on the face (top) of the guitar. The back and sides have a dark grain – the mahogany laminate. However, the gloss finish wraps around the entire body and top of the guitar. With no accessories thrown into the mix for the buyer, you’ll have to accumulate all the necessities to protect and play your guitar. The DR-100 guitar is so affordable that you could still spend less than $200 for the extra bits you’ll need to get started. Lost on where to start? Our complete list will give you a starting point so you can get strumming and picking any second! To strum it up, the Epiphone DR-100 guitar is a full-size instrument for any player craving full-size acoustic benefits. Gibson comes through for the casual and cash-strapped guitarist who wants a well-built git for everyday use that’ll live through everyday abuse. The DR-100 is exactly what you expect – a quality guitar for an extraordinary price!